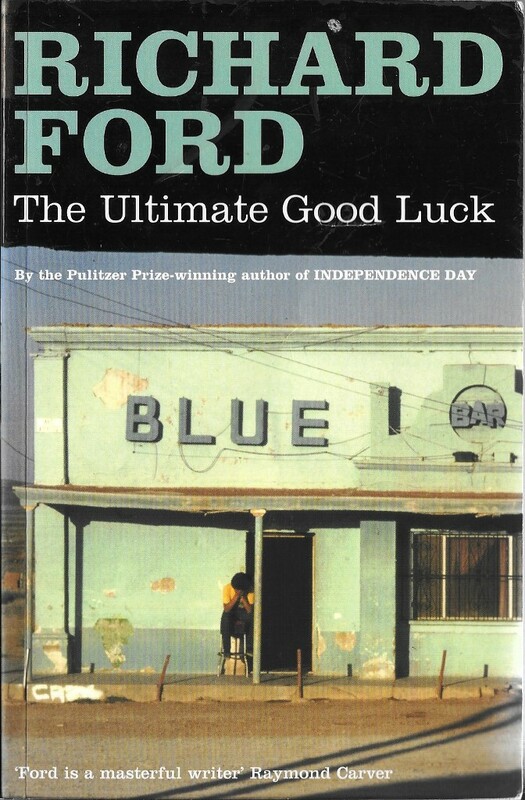 In the past week, taking a break from my local history project, I’ve determined to spend more time reading the novels I’ve recently bought and I read Richard Ford’s The Ultimate Good Luck (1981 review). I’ve long been an admirer of Richard Ford and have read most of his novels, especially the series featuring the enigmatic Frank Bascombe (interview with Ford). This is a much earlier work, written in 1981 and a different kind of Ford novel. The book is set in Mexico and the protagonist is Harry Quinn, a Vietnam veteran who feels alienated from the world, and who goes to Mexico to try to get his wife’s brother Sonny – a drug dealer – out of prison. It’s a very tense tale and the normal laconic humour you find in Ford’s more recent novels is absent. Quinn gets involved with some very nasty people involved in the Mexican drug trade – lawyers, police, the army, strong-arm men and their rich bosses. There are action sequences which are quite violent but Quinn is a reflective kind of man, who looks at the world with suspicion. There also some passages which demonstrate that Ford would go on to be a leading American novelist. One of the aspects of this book you will remember if you read it, is the ever-changing light in Mexico and Ford’s descriptions are superb e.g. “A mist had burned off the hills and been borne up, leaving the south end of the valley in a Levantine light… It was like a National Geographic ..” In another passage, the lawyer passes a truck repair yard and “Acetylene smacked in the thick air and made the night appealing”. Later, “Quinn could hear .. the low sibilance in the street, the soft ventral suspiration of any city..”. This fairly short book will keep you interested in the story and entranced by the enviable felicity of Ford’s writing, so get it if you can. A friend of my wife gave her an orchid last summer, as a present for my wife’s help and concern during her friend’s illness. It was put on to the kitchen window and remained static for most of the winter. Then a green shoot appeared but faded. Then another shoot appeared and this one continued to grow and in the past week or so, the buds which formed at the top of the shoot have opened. It’s a small plant but a miniature beauty. 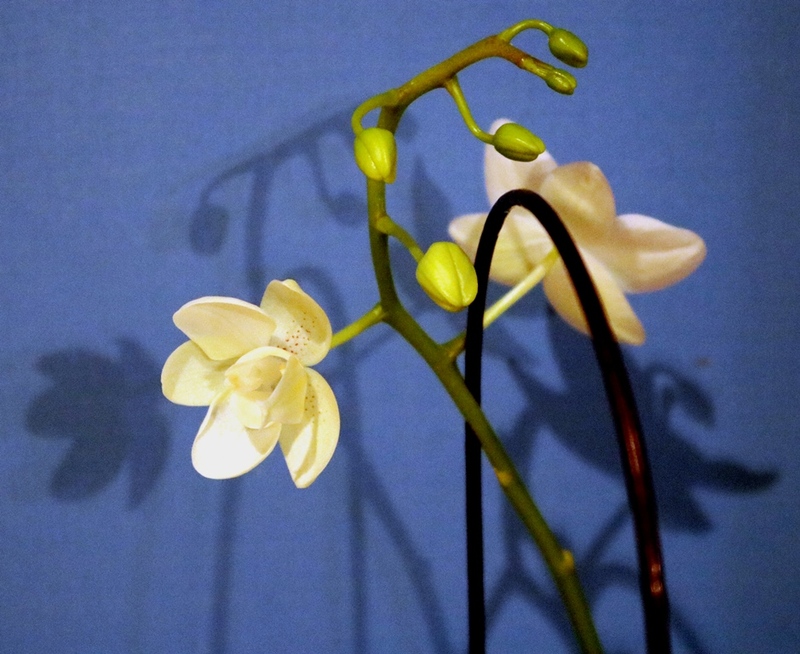 I came through one evening and noticed the orchid and its shadow against the drawn blind. So now we had the delicate flowers and their pale, but beautifully formed shadow behind, as in the photo below. I like the way the delicate flower, with its shapely petals and purple spots, contrasts with the rather menacing looking unopened buds, which appear to be ready to repel any attackers. The shadows of the flower on the left and of the buds are gentle, light grey reproductions, but the shadow of the flower on the right looks misshapen and ugly. The next photo is a close up of the flower on the left and, like all orchid centres, has a surreal look, with the petals appearing to be multiple bat-like ears of some weird creature with a protuberance at its centre. The splattering of reddish purple spots are more appealing. Sam Hamill’s poem “The Orchid Flower” begins “Just as I wonder/whether it’s going to die,/ the orchid blossoms/ and I can’t explain why it/moves my heart, why such pleasure/ comes from one small bud/ on a long spindly stem, one blood red gold flower/ opening at mid-summer, / tiny, perfect in its hour”. 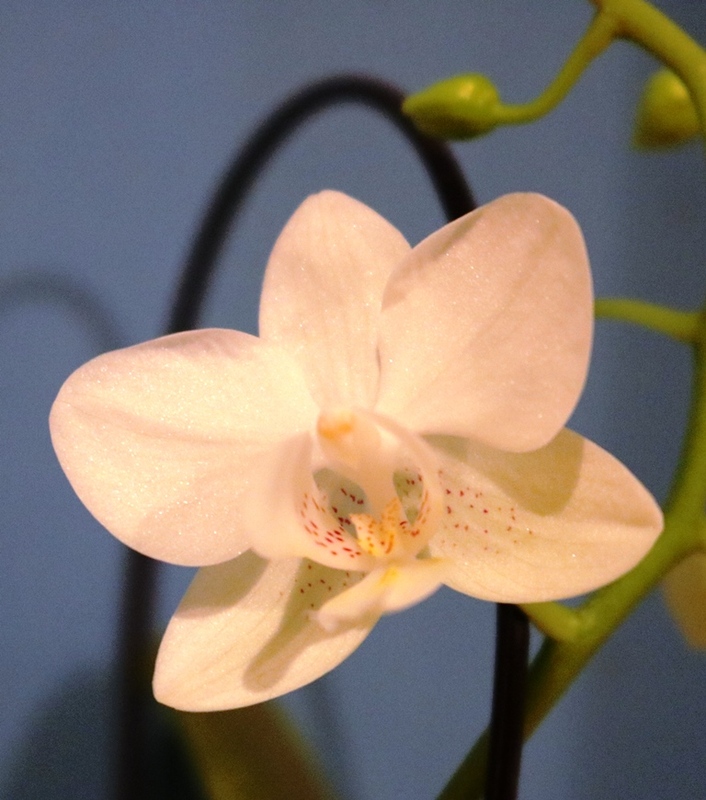 Hamill’s flower is different from this one and there are many varieties (good photos) of orchid, but I’d agree with him that our one is “perfect in its hour”. 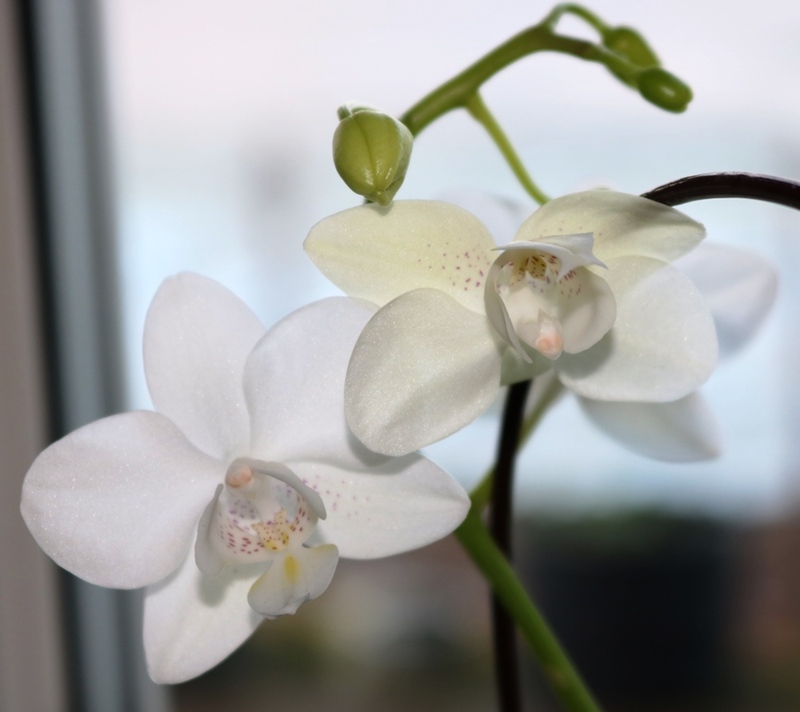 Today, I saw that a third flower had appeared and taken in the daylight, the new orchid (on the right) appears to have a creamier colour to its petal than its older sisters. This is a plant that is giving us some joy on cold February days. Outside, in the garden, the daffodil and tulip bulbs are nervously emerging from the ground, ready to hold fire again if another cold snap comes (and one is coming next week). In the warmth of the kitchen window, where it’s not too warm, the orchid presents a show in instalments, with each new opening well worth waiting for. This entry was posted on February 21, 2018 at 4:11 am and is filed under American authors, books, Flowers, nature, novels, plants, Poetry, Winter. You can follow any responses to this entry through the RSS 2.0 feed. You can leave a response, or trackback from your own site.